Entrepreneurship Development Institute, Gujrat has set-up a Centre in Women’s ITI Dighaghat in Collaboration with the IMC Industry Partner Astric Computers India Private Limited. 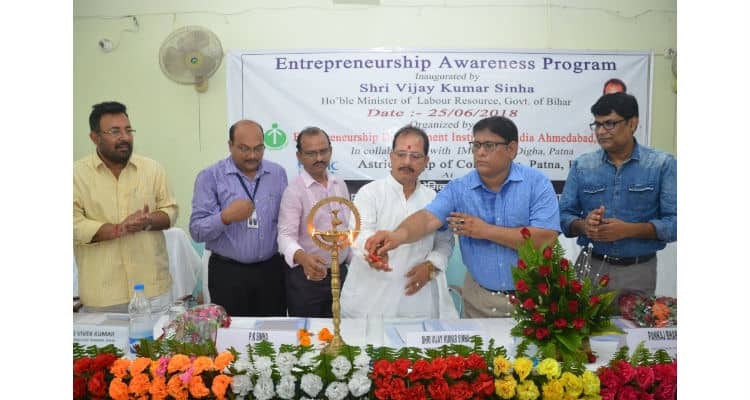 A workshop on Entrepreneurship awareness was inaugurated by Hon’ble Minister Labour Resources Vijay Kumar Sinha. Website of Women’s ITI was also launched during the event. Hon’ble Minister addressed upon the need of Entrepreneurship in today’s changing scenario and told that Govt. is seriously looking for awarding 10+2 Certification along with ITI Degree which will give a boost to peruse both commercial and formal degree and certification along with. He also stressed upon the quality and told the students that more short term courses under various state and central government schemes will linked for WIT students as. The collaboration will help in up skilling, self-employment, Skill Development and other entrepreneurship development related to girl students perusing their educations and vocation training at Women’s ITI at Digha. Prabhat Kumar Sinha ,Chairmanm Astric Computer highlighted the objective of this PPP transformation model for the selected ITI under this scheme. “The initiative will help transform Skill and entrepreneurship development related programme for the students perusing their educations and vocation training. The collaboration will also help design and launch various programs related to entrepreneurship and self-employment” said, Prabhat Sinha. Astric Computers set up Entrepreneurship Development centre in Bihar 0 out of 5 based on 0 ratings. 0 user reviews.